Years ago, my buddy, Suze, gave me a copy of Trattoria Cooking, a fine cookbook for easy, authentic Italian meals. 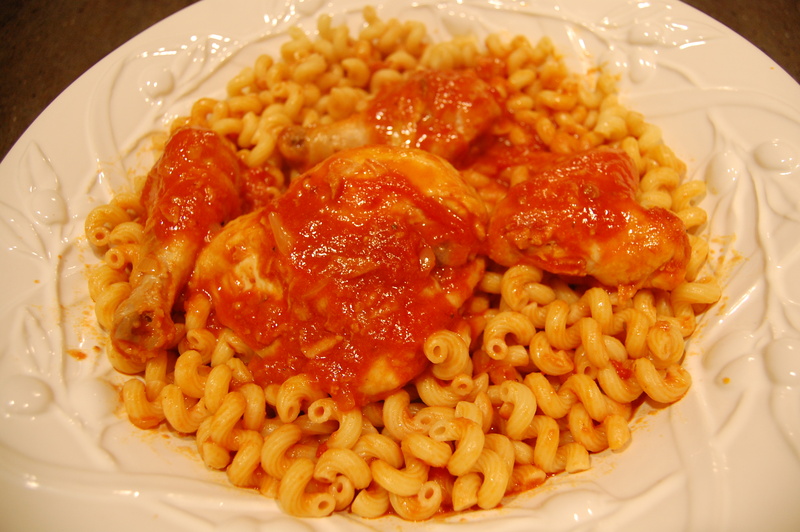 I've made her chicken cacciatore many times over the years. It's a great one-dish sort of meal. I've altered it a bit for my family, so that I have more sauce, which can cover pasta. The cookbook suggests serving polenta with the meal, which sounds good, too. 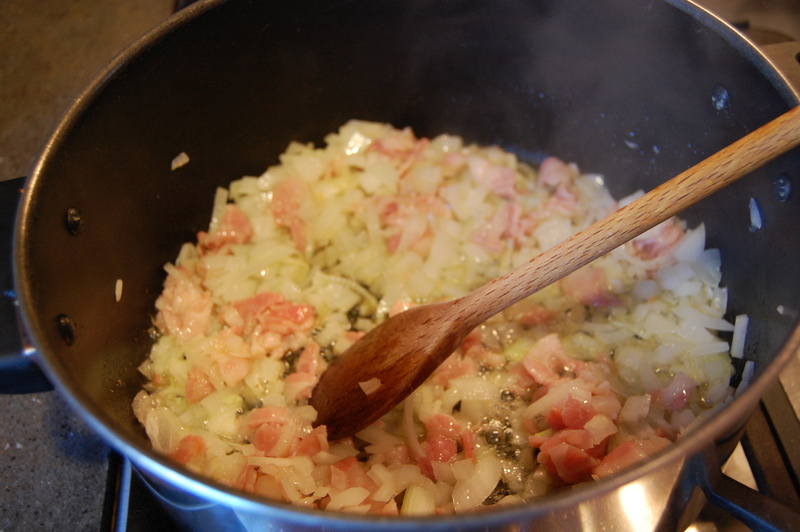 In that bigger pot, I add one diced large onion, 3 oz. 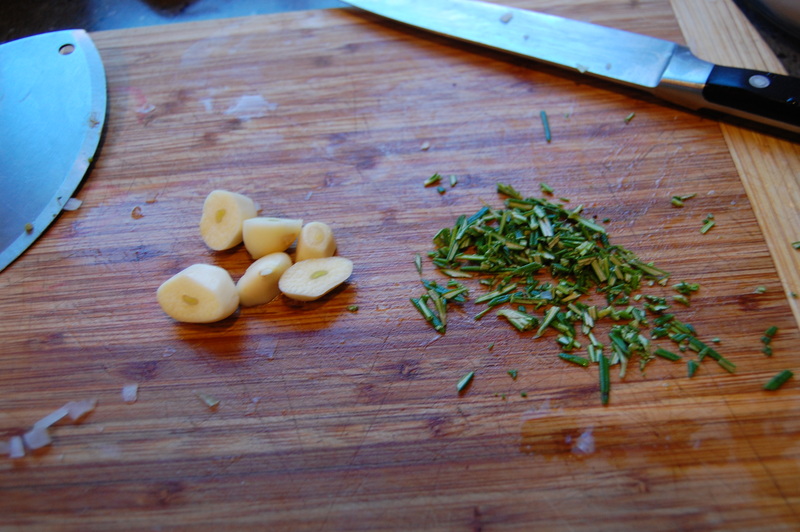 of chopped pancetta , 3 cloves of minced garlic, and 2 tbs of fresh rosemary. I cook it for a while, until it's all soft and happy. Then I put the chicken back in the pot with all the onions and stuff. Then, I turn the heat up high. I add 1 cup of dry Marsala. I go for the expensive stuff here, because it's such an incredible flavor. I like dry Florio Marsala, which is about $15 a bottle. We use it for other stuff, so it's worth it. I let the Marsala cook for about five minutes, until it has been reduced quite a bit. Then I add two cans of GOOD crushed tomatoes. I bring the tomatoes to a boil and then reduce the heat to medium-low. It cooks for 40 to 50 minutes. 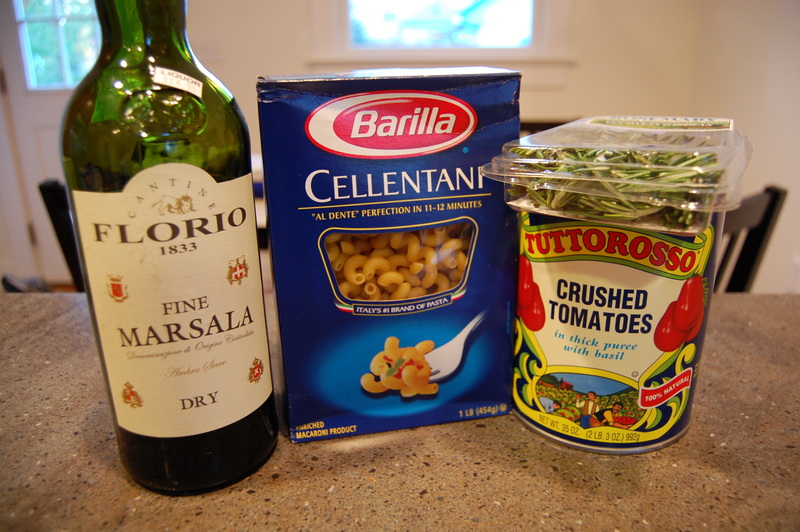 I love to use cellentini pasta with this. The sauce is very loose and gets into the tube shapes nicely. < Previous Seth Rogan AND Conan. It’s awesome. That looks pretty good. On a side note, Marsala wine helps is cooking, but it is nearly undrinkable. OK. A question. Where did you learn to cut up a whole chicken? Did your parents teach you? Did you figure it out yourself? Did you learn in Home Ec. I learned a bunch of things in Home Ec, like how to measure brown sugar and sift flour. But we didn’t learn how to cut up chickens. That’s always the failure point for me for these recipes. I’m not sure I’m willing to learn how to cut up a whole chicken (I grew up vegetarian), but, my kids like chicken, and it seems like a good source of protein, but I always get stuck at that point. bj, I make cacciatore but I just buy a pack of legs and a pack of skin-on breasts, or whatever combo I can find. I use approximately the Joy of Cooking recipe. I am the world’s laziest cook, so I decided long ago that the browning with flour didn’t matter much. Where did you learn to cut up a whole chicken? The best way to learn to cut up a chicken is to study how to put one together. Go to KFC and get a bucket with the trimmings. 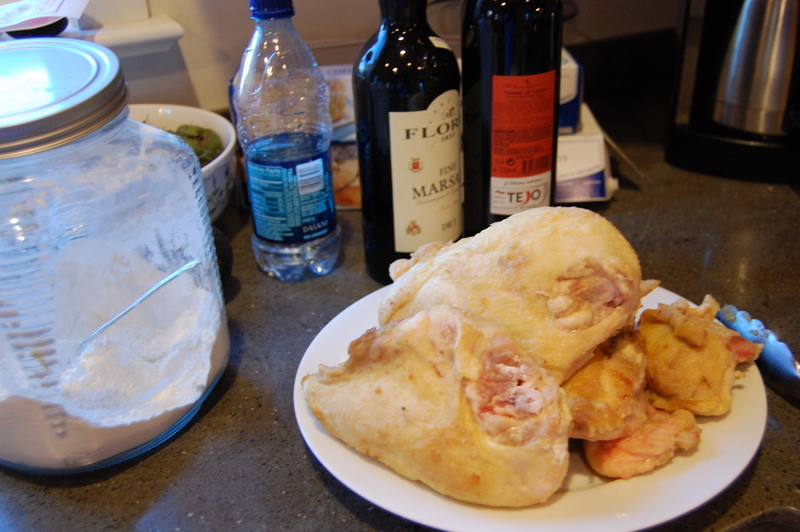 Using the mashed potatoes and glue and the biscuits for a stand, reassemble the chicken. bj, ha! I bought it like that. “Cut up chicken” is packaged up at the store. It’s really cheap, too. On sale, you can get the whole thing for $4. It’s not that hard to cut up a chicken. Even if you make a mistake, you can still eat it. Removing the limbs is just a process of finding the joint with the knife. For the wing, just find the “shoulder” and wiggle the knife around until you go through the joint. Cut the thigh from the body before you cut the leg from the thigh. To find that joint, just pull down the leg and see what is wiggling at the other end. Then cut the leg from the thigh. After that, just forget about being delicate and just cut out the spine by going through the ribs on either side. Then you smash the breast flat and cut carefully on either side of the plastic-like cartilage fin between the breasts. You can use the spine to make soup, or, if you have any sense of the value of your time, throw it away. Use your browned flour to make a roux for chicken gumbo. I remember the first time I made a roux and was surprised at how easy it was to make a sauce. Oops, wrong moniker. I blame sampling the cooking wine. It’s easy to get crossed when you use different names. Ooops. That’s the name I use for the blogs about 80s pop, mystery novels and boxing. Ick, MH. You’ve just pointed out why I’ve never learned how to cut up a chicken. (I forgot to mention that I’m a the kind of non-vegetarian who only eats meat without bones in it: chicken breast, with the bones removed, ground beef, filet mignon, fish fillets of the right type. But, Laura, you’re telling me that I can buy a “cut up chicken” and then follow the instructions from there? My kids are willing to eat meat with bones in it, even though I don’t. bj, I know other non-vegetarians like you, and possibly originally from the same part of the world. So we’ll call it culture! I was also very squeamish when I first stopped being a vegetarian, and I still don’t like bones as much as my Caribbean-raised husband. 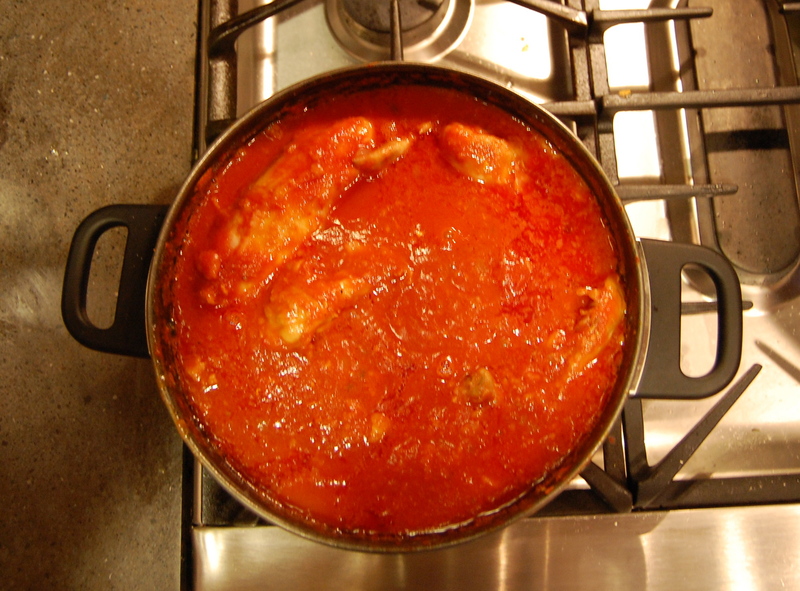 I like chicken recipes that involve simmering things for an hour (like cacciatore) so I don’t have to worry about “How done is done?” If it is falling apart, it is surely done. And if it is covered in yummy sauce, no one will know it is overdone. bj, sure. I bet you could even make this recipe using boneless chicken breast. You wouldn’t have to cook it as long. I suspect that it wouldn’t be as tasty and the chicken might be a little drier, but I’m sure it be fine. Here’s one recipe. Here’s another. BJ, you can make a puppet with a chicken. Put your hand in the cavity until one finger is sticking out the top end. Put a small hat on that finger. My method involves a bit more grumping and less attractive end pieces but it’s not that hard. A good large knife helps. I used to be the squeamish cooking type but now I do minor butchery all the time like cutting my own steaks, deboning poultry (messily, again). I also recently read the really…odd… memoir-sequel by Julie Powell of Julie & Julia fame, where she becomes a butcher and really really gets into it, while having an affair. It was way more butchery than I really wanted but now a chicken looks pretty good.